Delayed cerebral vasospasm after aneurysmal subarachnoid hemorrhage (SAH) is a major cause of high morbidity and mortality. The reduced availability of nitric oxide (NO) in blood and cerebrospinal fluid (CSF) is well established as a key mechanism of vasospasm. Systemic administration of glyceryl trinitrate (GTN), an NO donor also known as nitroglycerin, has failed to be established in clinical settings to prevent vasospasm because of its adverse effects, particularly hypotension. The purpose of this study was to analyze the effect of intrathecally administered GTN on vasospasm after experimental SAH in the rabbit basilar artery. A single-hemorrhage model of SAH in rabbits was used to induce vasospasm. GTN (0.5 mg/ml) or saline was infused via a subcutaneous implanted osmotic pump with continuous drug release into the cerebellomedullary cistern over 5 days. The degree of vasospasm in the basilar artery was recorded with angiography on day 5 after SAH and was compared to baseline angiography on day 0. Significant reduction of basilar artery diameter was observed in the SAH group with saline infusion compared to sham-operated animals. Intrathecally administered GTN had no effect on the vessel diameter in sham-operated animals, whereas it significantly prevented vasospasm in the SAH group. Intrathecal GTN infusion did not affect arterial blood pressure. Prophylactic, continuous intrathecal administration of GTN prevents vasospasm of the basilar artery in the rabbit SAH model. No toxic effects could be demonstrated in this study. The clinical safety and feasibility of this strategy need to be further investigated. In the present report, the authors have studied the effects of intrathecal administration of the NO donor glyceryl trinitrate using a single-hemorrhage model in the rabbit. GTN is shown to reduce the SAH-associated vasoconstriction of the basilar artery by approximately 10% during a 5-day infusion protocol using osmotic mini pumps. The results are statistically significant but seem to be not too impressive with respect to clinical relevance, especially in light of the drawbacks of the single-hemorrhage model in the rabbit. On the other hand, this study may serve as a proof of concept for further development of strategies that aim at local delivery of NO donors to the basal cisterns. We strongly believe that the recent, disappointing results with the systemic administration of vasoactive drugs in order to prevent cerebral vasospasm underline the necessity of promoting alternative routes of drug administration, especially directly to the affected blood vessels. This can be achieved by using continuous infusion techniques or the use of slow-release formulations. For the future, this certainly is the most promising concept for achieving an optimal vasodilatory effect at the vessels and, at the same time, avoiding systemic side effects that might counteract the beneficial effect of the drug. 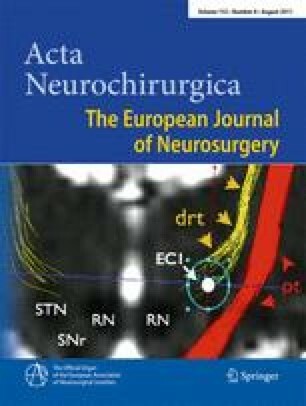 This paper explores the use of nitiric oxide donors in the intrathecal space for the treatment of subarachnoid hemorrhage. The topic itself is not new. Intrathecal pumps and intrathecal polymers delivering nitric oxide agents directly to the subarachnoid space have been tested in trials over the last several years, mostly with encouraging reductions in pathological markers of vasospasm. In the vein of these past studies, the authors have demonstrated that glyceryl trinitrate, a compound previously abandoned as a systemic therapy for vasospasm, may have genuine therapeutic value as an intrathecal agent. They demonstrate that intrathecal delivery of this nitric oxide donor does not produce the same prohibitive hypotension noted in systemic administration. While they also demonstrate that basilar artery diameter reduction was less with the experimental arm, it would be interesting to know whether delayed administration of this drug would produce similar results. Few patients, after all, could have intrathecal administration of a drug immediately with their aneurismal rupture. The concept is clever and promising, and we hope to learn more from this group.